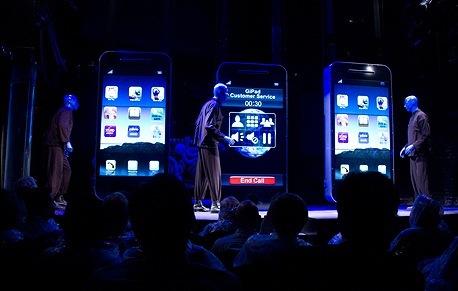 The Blue Men encounter the latest tech craze. That’s how long it’s been since I last saw the Chicago production of Blue Man Group — that enduring piece of mixed media performance art featuring a trio of mute, bald, electric blue, otherworldly performers who catch marshmallow’s in their mouths, drum new-agey tribal beats on PVC pipes, and crawl over chairs in a quest to select their next victim for bizarre onstage hijinks. The reason for my return trip was to not only revisit what my 16 year old brain considered mind-blowing, but to also see the new material recently added to the show — changes made in an effort to sync it up to our modern ways. But before I go into what’s new, let’s discuss why this off-loop show has endured for so long. Aside from the obvious qualities of splatter and spectacle, Blue Man Group‘s appeal, I think, stems from its surprisingly insightful observations on information overload. This theme hit a raw nerve when the show premiered in the mid ’90s, as the internet age was exploding and multi-media was omnipresent. But, my: how far we’ve come. It seems almost impossible, but 1997 (the year BMG opened at Chicago’s Briar Street Theatre and the year I saw it) was before the age of Google, Facebook (even MySpace), YouTube, widespread high-speed internet and mp3 players. Even cell phones and texting where novelties — at least where I grew up (Northern Michigan). With all these fancy tools at our disposal, how better off are we? And here’s the irony: while we’re connected with each other like never before, we’ve turned into a generation of people who hide behind our handheld devices rather than engaging with the people around us. Even phone calls are becoming passé: data plans are surpassing voice plans. Our relationships are evolving — or dissolving, depending on how you look at it — into data bits. With all this in mind, the new stuff they’ve put in this refreshed version of the show is pretty awesome — insightful but always entertaining. The biggest additions are three giant smartphones (essentially iPhones) that descend from the rafters that the Blue Men poke and swipe at with their patented stone-faced, wide-eyed amusement. There’s also a new, more eco-friendly finale that reduces the toilet paper waste by supplementing it with six giant, glowing Zygote Balls. It’s a full-out party every night at the Briar Street Theatre. But, while there are a few new gimmicks and flashy toys, the core of Blue Man Group remains unchanged. Our mind-numbing modernities, regardless of their technical complexity, still serve as playthings to these cool, blue dudes, and they continue to shake us back into reality with bass-filled drum beats and that ever-exhilarating “will they pick on me?” audience interaction technique. There’s no hiding behind your handheld at this show. This is a visceral, loud, energetic production that remains among my favorite Chicago theatrical experiences. And nearly a decade and a half later, my mind was still blown. Let’s hope the Blue Men stick around another 14 years to keep us in check. Yeah, it’s a big spectacle and it’s something of a tourist trap, but it’s also one of the most awesome experiences I’ve had here, and it was so much better than I even imagined it was going to be. The scrolling text at the beginning of the show alone is funnier than a lot of the crap I’ve seen around town.